With this 64oz blender you can make juices, smoothies, soups, ice cream, dressing, salsa, frozen drinks, pudding, peanut butter, crushed ice, mayo, pesto and more. Cutting blades measuring 3-inches in diameter to ensure consistent blend. Vented lid with plug for safely adding ingredients while machine is running. Blend juice or crush ice. Features a patented six blade technology that crushes ice, whole fruits and vegetables quickly. Ergonomically designed handle offers a comfortable grip. Blades, pitcher and the lid are easy to clean. This blender is a professional, high-powered innovative kitchen tool with a sleek design and outstanding performance. Perfect for blending, pureeing, ice crushing and controlled processing. XL 72-ounce pitcher for large family. Two 16 ounce single serve cups included that are excellent for smoothies on the go. Settings: 1,2,3, pulse, single serve. Dimensions: 16.4" x 12" x 9.3". This Mega Kitchen System is perfect for food processing, frozen blending and nutrient and vitamin extraction. XL 8 cup Processor bowl for chopping and dough making. 2 Horsepower 1500 Watts Professional Kitchen System. 2 Professional Nutri Ninja Cups for Nutrient and Vitamin Extraction. 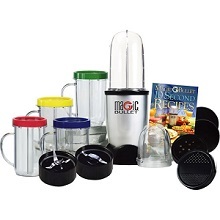 The Magic Bullet 17-piece set is a great handy countertop appliance that can chop, blend, mix, whip, grind and much more. Super convenient dispensing spout . 56-ounce jar is dishwasher safe. 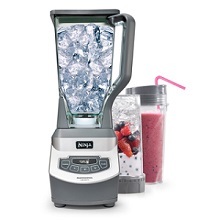 Blender is perfect for liquifying frozen fruits or whipping up creamy smoothies. Features a generous handle and drip-free spout for graceful pouring. This Oster 14-Speed blender is multi-functional, versatile blender. Voluminous 6-cup Boroclass glass pitcher is sturdy, scratch resistant and dishwasher safe. Powered by 450 watts motor. Stainless steel "ice crusher" blade; chop and grind also. Pluse feature for precise blending control. 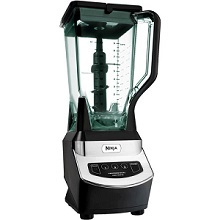 All metal drive system for a longer lasting blender. 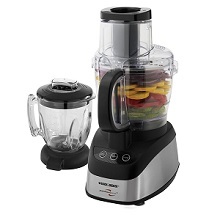 This wide mouth food processor and blender chops, slices, grates, shreds and purees with ease. 500 Watt motor and tons of torque. Included attachments: Dough blade, chopping blade, reversible slicing/shredding disc, pulser. 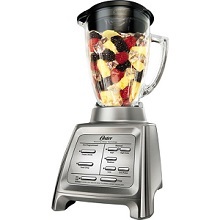 This Oster blender comes equipped with a powerful 1400-watt motor. The Oster Versa Performance blender can keep up with a wide range of culinary endeavors. Make fresh juice, puree hot soups, whisk sauces, whip up sorbets and more. 3 Programmed Settings, plus pulse. Blend, stir, puree, liquify and chop with this five-speed blender from KitchenAid. 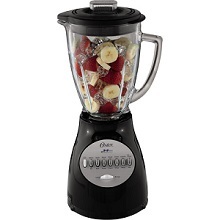 This Oster Designed for Life 7 Speed Blender has a reversing motor technology that switches the blade direction to eliminate clogging and draws contents into the glass jar for uniform blending and chopping. 6 cup capacity glass jar. 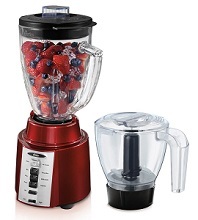 This Oster countertop blender with food processor attachment has simple, one-touch pushbutton controls. 6-cup, glass blender jar, dishwaher safe. 450 watts of power in 8 varying speeds. Food processor attachment features a 3-cup bowl perfect for mixing, chopping and mincing. Oster all metal drive for lasting durability. 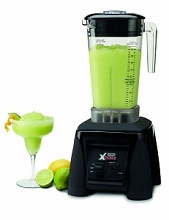 A high-performance 3.5 peak horsepower motor comes on this Waring commercial xtreme blender with glass jar. Great for use in smoothie shops, coffee shops, bars, resturants and even your own home kitchen. This blender is ferocious enough for everything from frozen drinks and smoothies to desserts, thick spreads, dressings and most all types of food preparation. The Xtreme consists of simple HI, LO, OFF and PULSE paddle switches which are easy to use and find in dimly lit locations. comes with easily removable container cover with removable clear cap for adding ingredients. This 3 HP dynamo of a blender will liquefy fruits and vegetables to get the most proteins, vitamins and antioxidants from the whole food into one delicious drink. 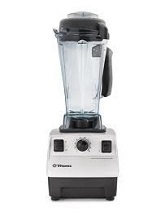 The Cleanblend commercial blender is less expensive than most of its competition but is packed with the same features. Blender has an oversized, virtually unbreakable 64 oz BPA Free container. Stainless steel enclosed blade assembly with sealed ball bearings. Includes tamper wand for extreme processing power. NEW - 5 year warranty. 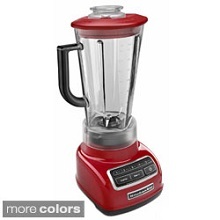 This made in America brand blender has a quality commercial grade construction that makes maintenence a breeze, offering years of use. 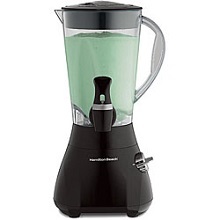 This Hamilton Beach blender is a 32 oz. commercial blender that is perfect for all your mixing and blending needs. Most of us are always searching for better ways to save time in the kitchen while still preparing nutritious meals for ourselves and our family. Countertop blenders have become a hot item to ensure getting all of the nutrition we need from one powerful container. Many of our fruits and vegetables provide better quantity and quality of nutrients when blended rather than cooked. That’s why so many have turned to smoothies and juicing for health. Like other types of small kitchen appliances, countertop blenders come in all sizes, shapes, prices and benefits. If your kitchen is short of counter space, check out the blenders with a smaller footprint than the older, more traditional models. The personal, to-go models which only contain 3 ½ oz. or less of liquid and you can take them with you on the go. No matter which size you choose, you’ll be turning ordinary fruits and veggies into a powerful and convenient meal by pulverizing them and preserving the nutrients. The more expensive countertop blenders strive to provide the consumer with space saving engineering and technologically advanced ways to blend your foods. Some are made to mimic professional power appliances with blades built to crush ice and pulverize veggies and fruits into a liquid drink. If you really would like the ultimate in convenience, you can choose a countertop blender that chops, grinds and blends whole vegetables into soups or sauces within 10 seconds. Some even come with extras such as pitchers and to-go mugs which are sealable and won’t spill. 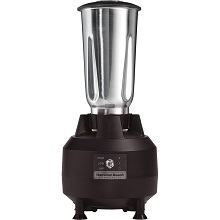 Made in America Hamilton Beach Commercial Grade Blender - If you want a lot of horsepower in a blender even for your home use then check out the commercial grade blenders. Some have stainless steel jars and some have a glass container. All are high powered performing blenders for use in smoothies shops, coffee shops, resturants or just that deliouse smoothie in your own kitchen. Some new countertop blenders have the look of a futuristic appliance, made with stainless steel and bullet shapes. Others may look like the blenders of yesterday, but have amazing new powers that can get the job done faster and save nutrients better. It’s incredibly easy and time-saving to eat healthier with a blender. You don’t have to resort to a tasteless liquid diet to enjoy the benefits. Whip up fabulous recipes such as a spring onion frittata or a mango-yogurt smoothie – or try the Greek yogurt blender pancakes to get you through the morning. Take a quick look at the recommedations above to see the wide array of countertop blenders and choose one that’s right for you and your family. Also, check out the online recipes and books of recipes available that will give you an entirely new way of thinking about how you can enhance your health and save food prep time with blenders. Tips For Keeping a Clutter Free Kitchen - with more and more open space house plans, keeping your kitchen tidy is more important than ever before. Children can have neck and back problems as well as adults. To help with this be sure that they have a comfortable pillow They can even take their comfy pillow with them to sleepovers or for nap time at school. Provide a germ free zone for your baby while shopping with one of these shopping cart covers for babies. Folds up small enough to fit into your diaper bag. Most everyone knows someone who has a new baby and therefore is in need of a baby gift. Check out these popular and useful baby gift sets at this site.